Pretty colors and pattern. Livens up an otherwise dull corner in my kitchen. Rabbit Cracker Serving Dish Tray - White Ceramic 10 1/2 Inches Long - 10 in. x 3 in. x 5 in. 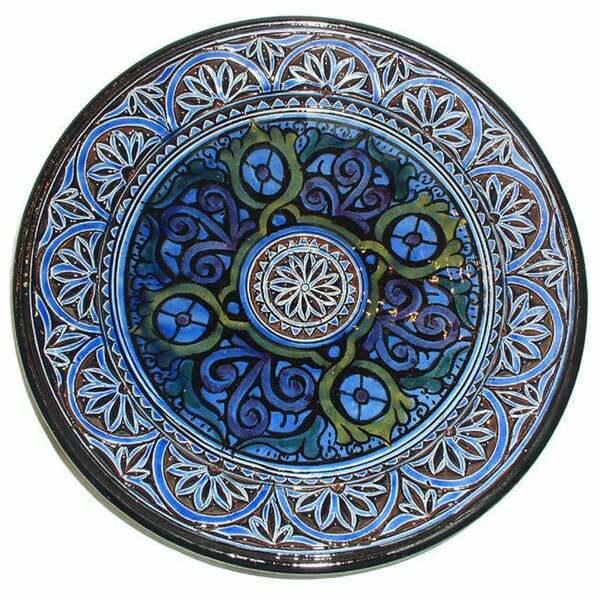 Bring a touch of classic Moroccan pottery to your home with this engraved ceramic plate. Created by master artisans of Safi, Morocco, this pottery is a fine example of traditional Islamic art. Pottery of this type is made in Safi, Morocco, a fishing village on the Atlantic coast. Safi is known as one of the centers for this art form and uses red clay to create ceramic pottery. Clay is softened by hand, and formed using a potter's wheel which is powered by foot. Pieces are dried in the hot African sun, and baked in kilns that are over 200 years old. All items are hand-etched and hand painted. Artisans live comfortably yet modestly, most living with extended family. Artisans work in the souk (market) in the medina (center of town). This art form is passed down from father to son. Moroccans are very proud of their arts and in preserving their heritage. I always read the reviews before I purchase items from Overstock and based on the reviews on this plate, I went ahead and ordered it. The plate arrived in perfect condition and was well-packaged. I was pleasantly surprised with the details and quality of it. It's a beautiful addition to my kitchen. I really love the plate. The colors are beautiful and I have received lots of compliments from my friends and family. It is a wonderful addition to my dining room decor. This product is not yet released, and is expected to ship on Jan. 15, 2006.